Free ticket day, well ok apparently it’s European heritage day, but either way we didn’t have to pay the €12 each, although this place is well worth more ! We are at another of those places that we put on the must see list before we left. Somehow the 2012 London games left a lasting impression on me. Seeing the Olympic torch make it’s way through England and the pictures of local people holding the Olympic torch are still fresh in my mind. Olympic fever gripped our tiny nation, and now we stood a few steps away from the place it all began ! 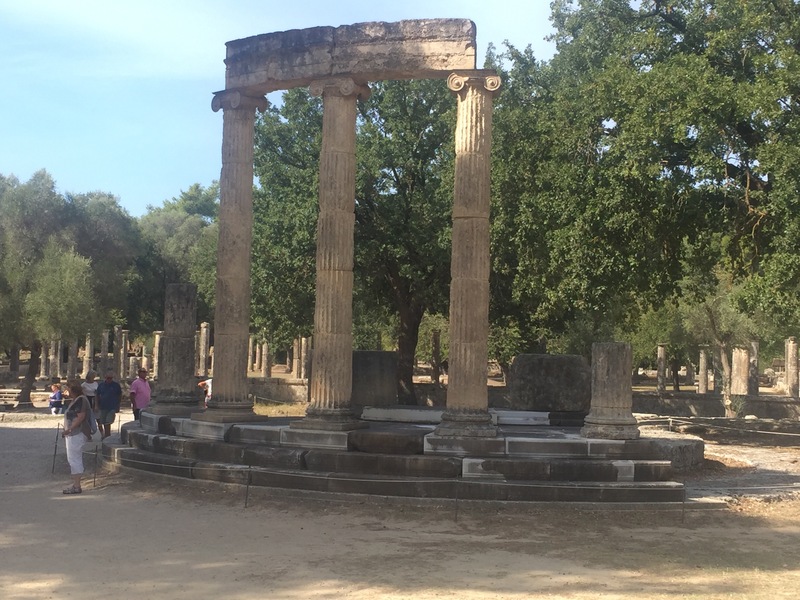 Not knowing what to expect, I was immediately blown away by what is called the ‘Sanctuary at Olympia.’ Dating back to the 10th century BC, the area flourished until 426 AD when the emperor Theodosius II closed all ancient sanctuaries. 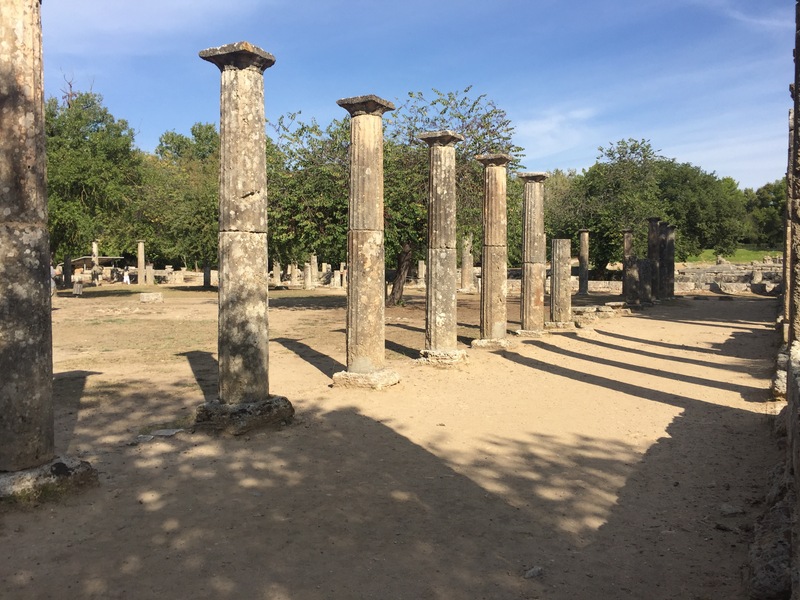 The area is filled with trees, flowers and lush greenery but was littered with ruins – including stunning mosaics. Most ruins had a plaque in English showing an image of what it looked like back in the day so it wasn’t difficult to imagine the spectacular beauty of the sanctuary. 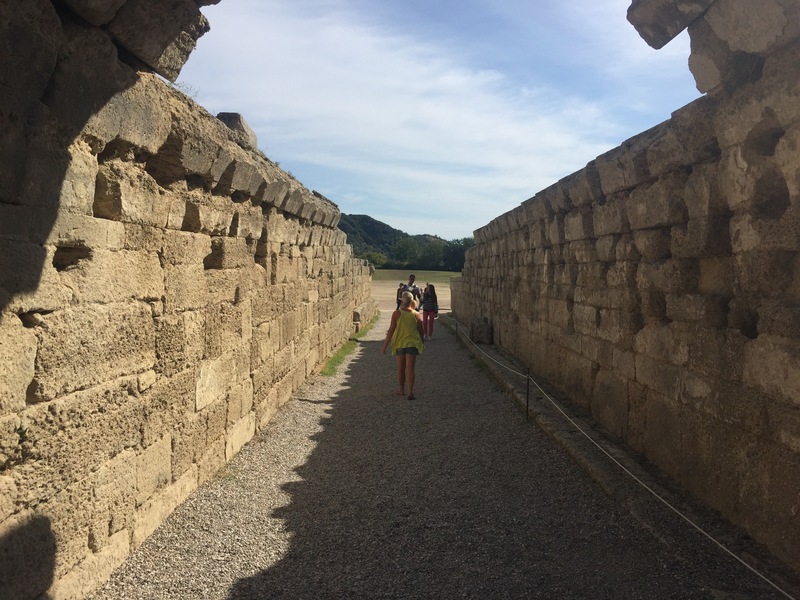 Upon entering the archaeological site, the path will take you along the length of the gymnasium and to the Palaestra. 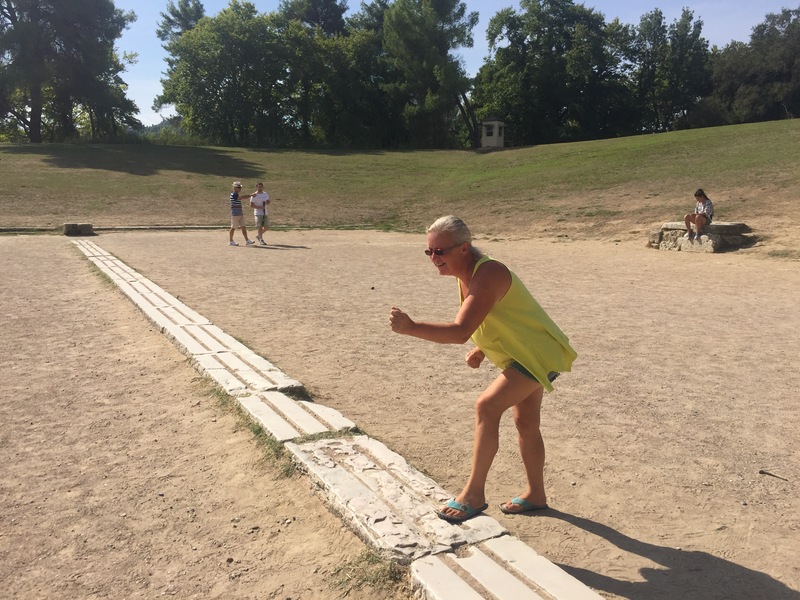 The Palaestra was built in the 3rd century BC as part of the gymnasium and was where the athletes would practice boxing, jumping and wrestling. 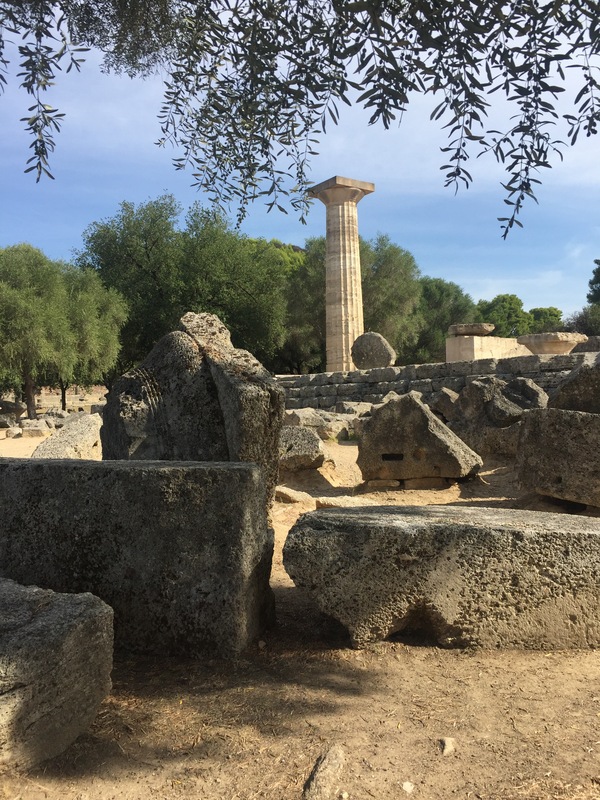 The sites most important building was the Temple of Zeus, a massive 5th century Doric temple, the biggest in the Peloponnese. The temple once housed the statue of Zeus, before it was removed by Theodosius II and taken to Constantinople. Today, all the columns lay fallen to the ground, except one which has been erected by archaeologists. 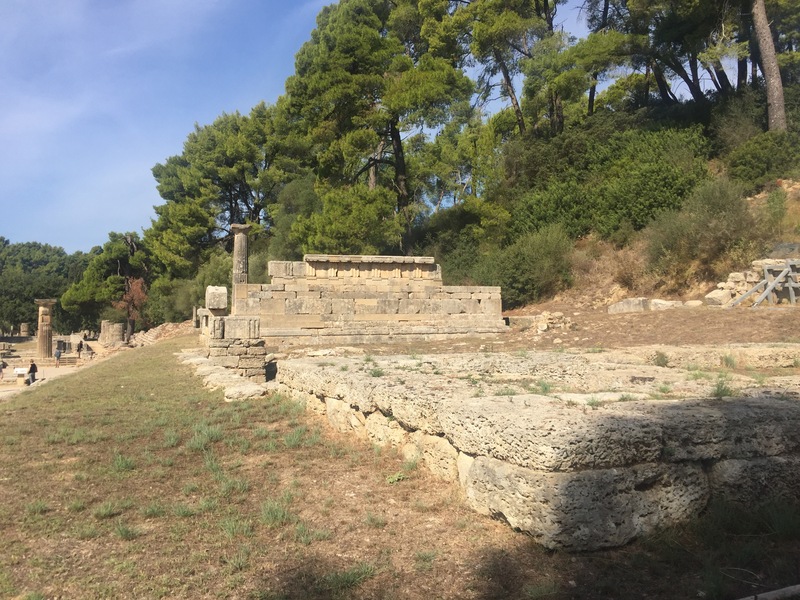 Standing at the foot of Kronos Hill, in the northwest corner of the site, is the Temple of Hera. It’s one of the oldest monumental temples in Greece and very influential in the history of Greek architecture. Built towards the end of the 7th century, it was one of the first examples of the Doric order on mainland Greece. West of the Temple of Hera is the Philippeion, a circular building built by Philip of Macedon to commemorate his victory in the Battle of Khaironeia (338 BC). The building housed statues of Philip and his family and was the only structure in the Altis dedicated to a human. 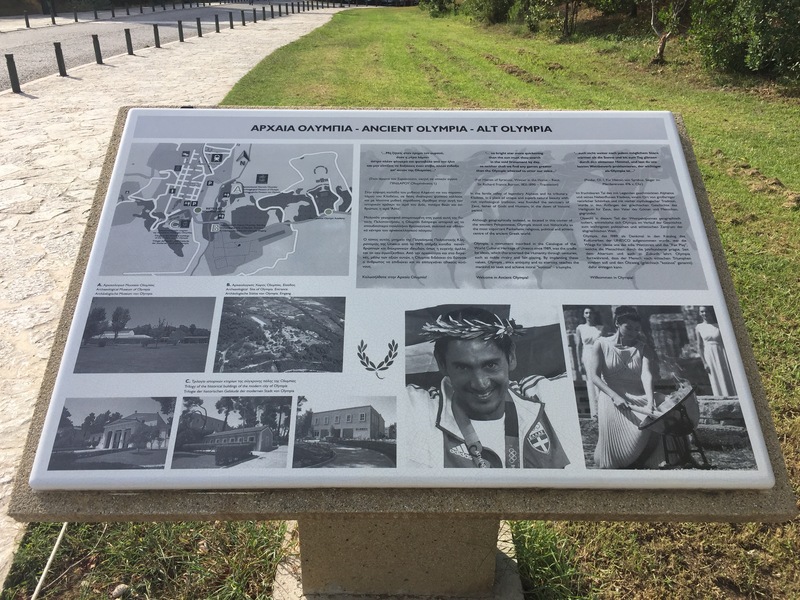 At the corner of the site is the stadium where the Olympic games were held. Entering through a stone archway, you are met with a 212 metre long sprint track. It’s amazing that the original start and finish lines still survive, along with the judges’ seats. The stadium could accommodate about 40,000 spectators, who watched the games from the grassy slope of the hill, as there were no permanent seats. And when in the Olympic stadium what must you do ? This was the ulitimate touirst shot, but how can you not pretend that we were competing in the running races. After taking like a million pictures and saying ‘wow,’ a few thousand times, we headed to the museum. At this point, I was a bit tired and a museum didn’t sound all that appealing. 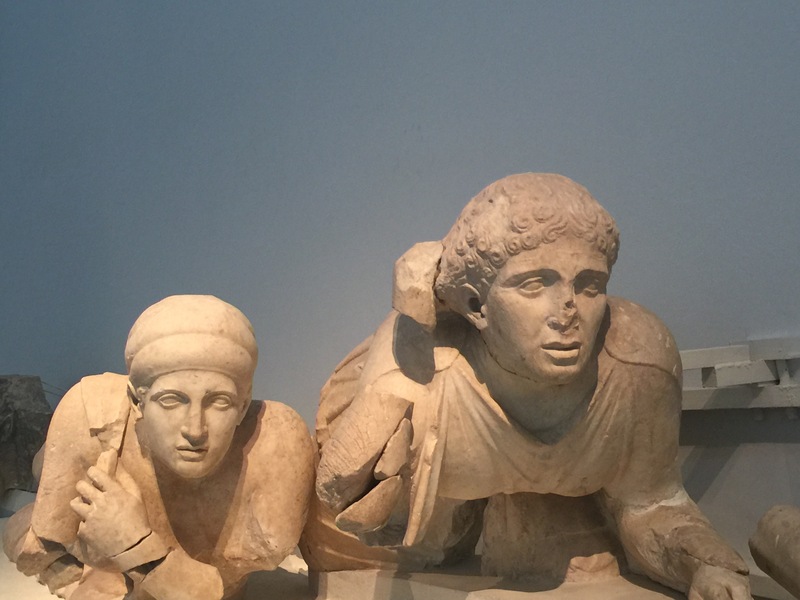 For me the best bit was the reassembled figures that decorated the pediments of the Temple of Zeus. 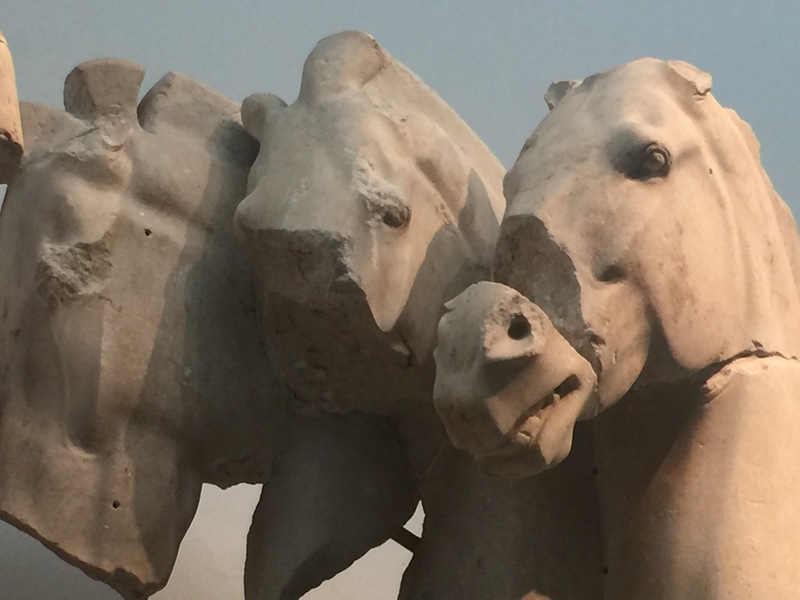 Even in their incomplete state, they are spectacular and tell an exciting story. The western pediment has Apollo as the central figure and shows the Centaurs abducting the Lapith women. 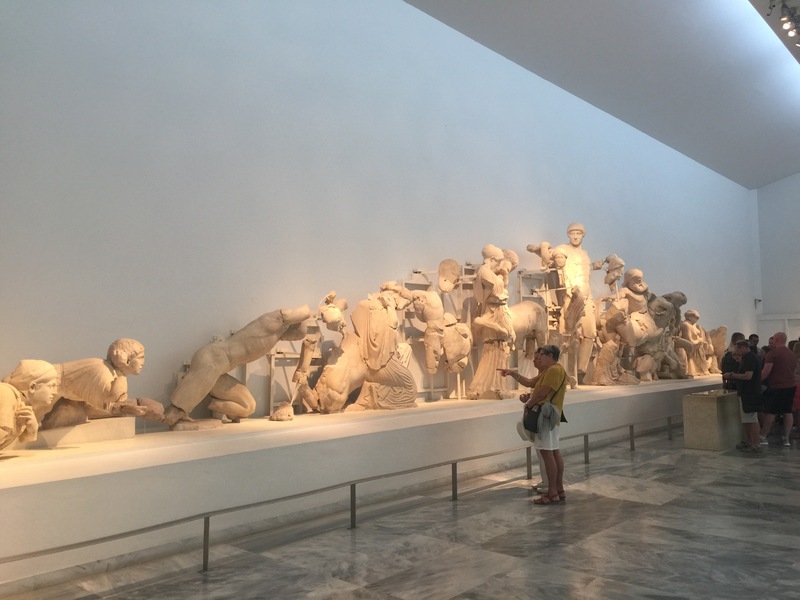 The eastern pediment has Zeus as its central figure and depicts the chariot race between Pelops and Oinomaos. Leaving Olympia we set our sites on another beachside pitch, just a few Km towards the coast, we stop at a set of traffic lights and fall victim to probably the best con ever ! Running across 4 lanes of traffic comes this little lad to wash the windscreen, well ok I didn’t want it washed, but I’d much rather that, than him just begging!!! Windscreen wash, I hand him a euro, he then pretends to drop it, making it look like it fell into the cab footwell, feeling bad (how stupid) I give him another……. Upon checking in the footwell, the dropped Euro wasn’t there !!!!! What a great Con !! A few more KM and we arrive on the almost abandoned stretch of sandy beach for the night. 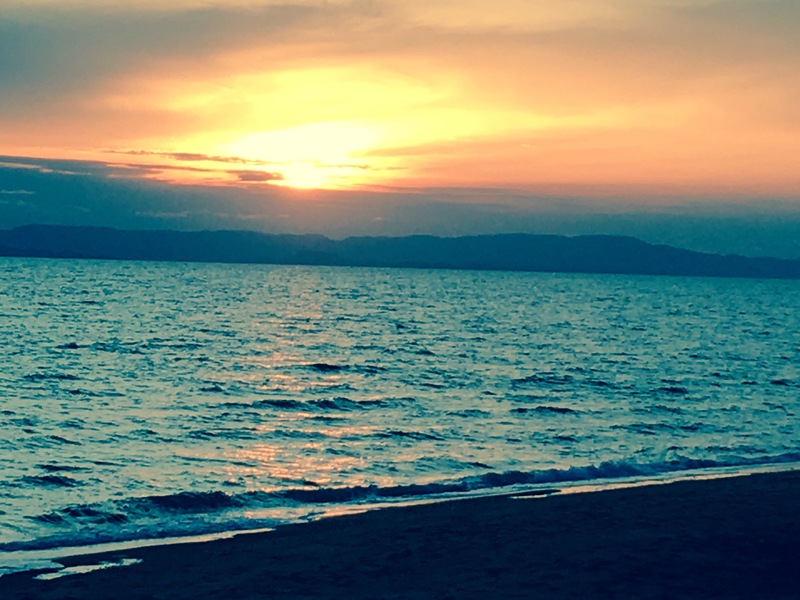 Savalia beach, provides us with super sunset out over what we think is Zakinthos (N37.797054, E21.255774). ← Oscar Wilde and Olive oil ….. Thanks Dave, we updated that now- but that’s why we don’t let Michele do the navigation…….